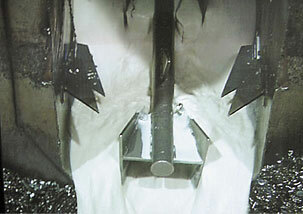 The draging bar conveyor is used for conveying long, curled chips with large drill lubricant flows. The conveyor is activated by an hydraulic plant and a roll. Running: The bar provided with a hauling hooks while feeding pushes by means of the hooks the chip balls forward, and while backwards these conglomerates remain hooked on billets placed on the frame. 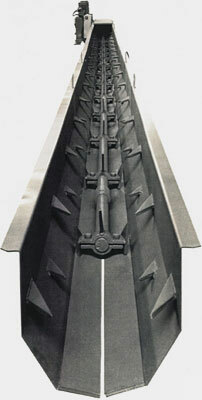 Continuous chippings evacuation is achieved with the conveyor. Bedplates do not get hot. Accidents caused by chippings are eliminated, especially when they are long and curled. The work place remains clean and eliminates downtime, output. Space is saved by the integrated or suspended conveyor.